With the course that close, you can squeeze in an extra 9. Treat the gang to a round at the resort bar. Overdid it in the sun the day before? Take a break from the rays at the indoor pool. You'll inevitably run out of something (snacks, sunscreen, etc. ), so it's good to know the condo's so close. You've got a prime stretch of Miramar Beach right in front of you. Seascape Golf Course is in your backyard. Majestic Sun Condominiums by Wyndham Vacation Rentals is a bright vacation palace that towers over the ivory sands of Miramar Beach. Lounge by the seasonally heated outdoor pool or soak in the just-right hot tub. The indoor pool is perfect for rainy days, or during the winter months. When it comes to on-site recreation, the resort has you covered. Get a workout at the fitness center, or take advantage of the eight tennis courts. For a bite to eat, head to the on-site pub and casual restaurant. Love to golf? You’re in luck! The Seascape Golf Course, an eighteen-hole championship golf course, is conveniently located behind the resort – all you need is a tee time. Air-conditioned one- to two-bedroom condos sleep six guests and are individually decorated. Full kitchens give you the freedom to make your meals. Winn Dixie grocery store is just over a mile away. Bring the kids along to help carry bags and to make sure that nothing important is forgotten. After putting the groceries away, enjoy a Friends rerun or a movie on the Cable TV, it has a DVD player. Pack favorite movies from home, put one of the kids in charge of snacks and another in charge of picking the first movie. In-suite washer/dryers keep you ahead of the clean-clothes game upon your return home. Do a little multitasking and throw in a load while the movie is playing. The Whale’s Tail Bar & Grill has been a landmark in Destin for over thirty years, and the resort is conveniently located just a short walk away. They are known for their seafood, burgers, and sandwiches. The Whale’s Tail serves breakfast, lunch, and dinner and even has a special menu just for kids. Up for a day of shopping? Check out Destin Commons. Get some new shoes at Foot Locker or Journeys. Let the kids create their own stuffed animal at Build a Bear. Tweens will love Justice and Claire’s. For apparel check out American Eagle and Express. If you’re into a good bargain, be sure to visit Silver Sands Premium Outlets. Little ones will have a blast at the Disney Store. Pick out your next beach read at Book Warehouse. Treat yourself to a new handbag from Kate Spade, Dooney & Bourke or Coach. Browse the apparel at Saks Fifth Avenue and Banana Republic. Hungry? There’s Cheeseburger in Paradise, Panera Bread or Carrabba’s Italian Grill. Don’t forget dessert from Pino Gelato or Mrs. Fields. - The front desk is open Monday-Friday: 9:00 AM - 5:00 PM daily. Check-in must be completed prior to going to the rental property. 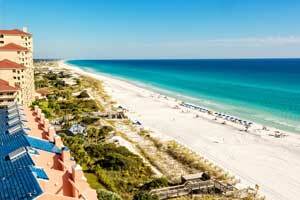 Guests must check in at ResortQuest Miramar Beach Office, 11125 US Hwy 98 W, Miramar Beach, Fl. 32550. Once nothing but untouched sands next door to Destin, Miramar Beach has blossomed into a charming beach community with luxury resorts and boutique shops.